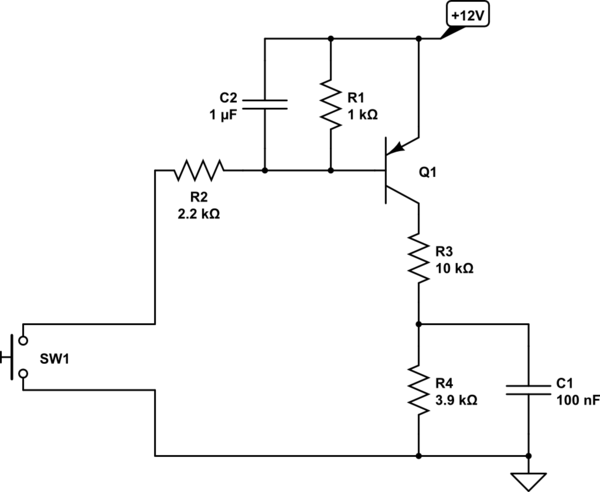 I have this circuit which must signal +3.3V or 0V depending on the switch status. The the switch is about 20 meters away and is getting EMI from mains. I realized that it only takes -0.7V of interference on Vb to make the transistor saturate causing a false switch pressing event on my ESP. How can I increase this gap in say 2 or 3 volts so it becomes less sensitive to EMI? I thought of series diodes on base like this (which is cheaper than shielding the cables) but is it correct? R2 and R1 are a voltage divider so any disturbance on the wires to the switch is attenuated by R1 and R2 (and optionally C2) making it much "harder" for the EMI to open the PNP transistor. Optionally you can add C2 to suppress EMI even more if needed. Do keep R1 and C2 close to the transistor. Not the answer you're looking for? Browse other questions tagged bjt noise esp8266 12v 3.3v or ask your own question. How to avoid input noise?